BlackArch Partners is pleased to announce the recapitalization of VP Holding, Inc., a former portfolio company of Fort Point Capital. 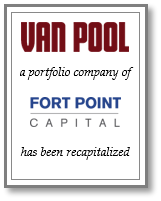 BlackArch Partners (“BlackArch”) is pleased to announce the recapitalization of VP Holding, Inc. (“Van Pool” or the “Company”), a former portfolio company of Fort Point Capital. Van Pool, headquartered in Wilbraham, Massachusetts, is a leading provider of transportation services for special needs and homeless students in Massachusetts, Connecticut and New Hampshire. Since Fort Point’s investment in 2014, the Company more than doubled revenue and EBITDA, extending its geographic footprint from its original Western and Central Massachusetts core, while completing two accretive add-on acquisitions. BlackArch was retained by Fort Point Capital and management to serve as the Company’s exclusive financial advisor. Fort Point Capital, based in Boston, Massachusetts, is a private equity firm that invests in lower middle market, business services companies in partnership with strong management teams. Since its founding in 2011, Fort Point has completed seventeen transactions, including eight platform investments, four exits and five add-on acquisitions. For more information, visit http://www.fortpointcapital.com. BlackArch Partners is a leading middle-market investment bank offering a full spectrum of advisory services to financial sponsors, private companies and diversified corporations. BlackArch addresses the needs of owner-operators, founders and shareholders of private companies with specialized services that include M&A advisory, strategic advisory and private capital solutions. Headquartered in Charlotte, North Carolina, with offices in Chicago, Illinois, BlackArch features a total of 12 industry-focused practices that cover all sectors of interest to middle-market investors; BlackArch professionals have closed more than 350 transactions in 16 countries on four continents. Please visit our website, http://www.blackarchpartners.com, for more details. Securities offered through BlackArch Securities LLC. Member FINRA and SIPC. Testimonials may not be representative of the experience of all clients. Testimonials are not a guarantee of future performance or success.